Lately I’ve been blogging about metal detectors and a charismatic antiques dealer at Queen St and Roncesvalles Ave in Toronto named Pickwick (Harold Barrett). And every now and then I’ll try to sell something online – this summer I’ve experimented with costume jewelry. For some reason I’m obsessed with finding a workable ‘buy local / sell global’ mercantile strategy; in other words buying relatively rare stuff cheap at yard sales, and then ‘flipping it’ for profit on eBay – its a nice idea, but I’ve yet to succeed. Each week, Rob Campbell (that’s me) updates the blog’s content and completes another chapter in the compelling quest to find history and grow as wealthy as the Wise Old Man. He has adventures all over Ontario and in the company of a metal roof contractor that works with aluminum shingles. He has a truck and specialized roofing tools which are also excellent dumpdigging apparatus. Each post is built to thrill readers with good information and the possibility of spectacular success; the blog is spiced with local adventures and the sauce of commercial avarice. 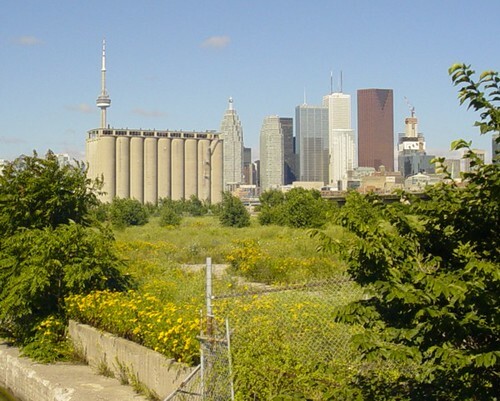 Here’s an August 08 vision of the east Lakeshore – this is the Golden Triangle of old Toronto. 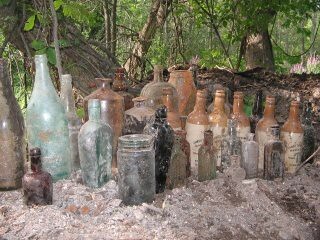 Buried under this lush vegetation from the Cherry St bridge west to Victory Soy Mills and north to Front Street are thousands of collectible bottles; a museum’s supply of early Canadian glass waits to be found. In the late 1800’s, early Canadian glasshouses made many different types of specialized vessels to contain medicines, liniments, whiskeys, ginger beers, inks, poisons, and milk – now this ‘gem field’ of beautiful antique glass waits for the next property developers or anyone with intuition and the strength to dig a deep hole. Dumpdiggers estimates that 80% of the east Toronto lake shore dump (which dates from the early 1900’s) will be scooped out and hauled away in trucks and then reburied in obscurity somewhere else in the city when this area is developed sometime in the next decade. Dumpdiggers will be watching from the gate.